If Mexican cuisine only brings to mind tacos and guacamole, then you're seriously missing out. As complex, regional, and unique as any of the world's most celebrated cuisines, traditional Mexican cuisine is ranked on UNESCO's list of "Intangible Cultural Heritage of Humanity" alongside the art of Neapolitan pizza making, Belgian beer culture, and the gastronomic meal of the French. Here, we'll cover a few fundamental ingredients as an easy overview to the diverse and delicious world of Mexican cuisine. Beans are a traditional staple of Mexican cuisine, providing the main source of protein in many meals. They are hearty, healthy, cheap, and still served in tons of Mexican dishes from breakfast to dinner, taco fillings to soups, and even sauces. While it's not a Mexican dish per se, this Slow Cooker 3-Bean Chili is a great weeknight supper that uses some classic Mexican flavors and plenty of beans. The convenience of using canned beans can't be beaten, but whenever possible you should use dried beans–since they hold their shape and texture much better than their canned counterparts, are usually available in more varieties, and are lower in sodium. Always feel free to vary the types of beans you use, especially in something like chili, which happens to taste amazing with nearly every beany combination. Don't fret if you can't handle heat–the variety of chilis used in Mexican cuisine is as much (if not more) about adding flavor and depth as it is adding spice and heat. 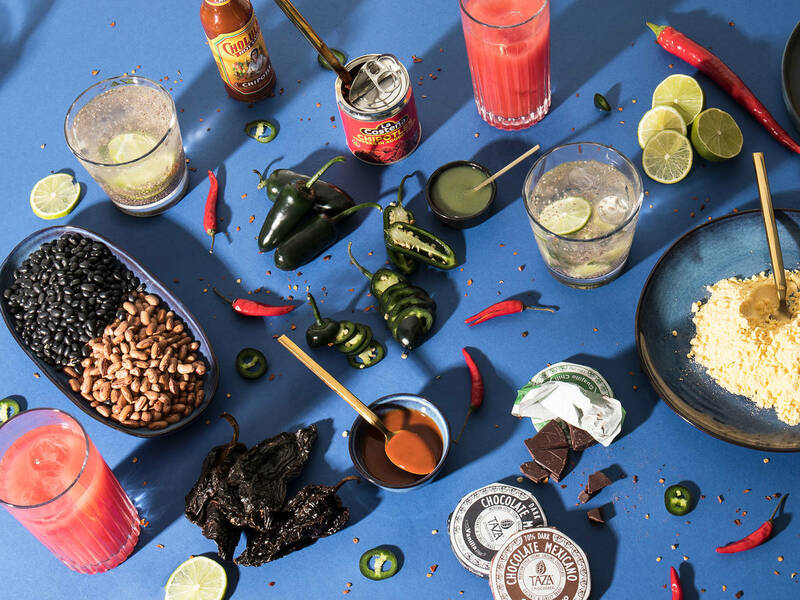 Some are most often used fresh or pickled, like jalapeños and serranos, which offer a bright, fast heat, while others are used in their dried form like pasillas, guajillos, and chipotles-offering smoky, earthy, nearly sweet flavors instead. It's common to use a few varieties in a single recipe, but when in doubt, know that the smaller chilis are generally hotter–a rule that's applicable for both fresh and dried peppers. Removing the seeds and stems can help curb some of the heat. Dried chilis usually need to be soaked in hot water for approx. 20 – 30 min. before use, but just like spices and nuts can also be toasted in a hot skillet before grinding up in a mortar and pestle. For an excellent introduction to dried chilis, try our twist on the classic American chicken and waffles, Mexican Chicken with Corn Waffles. Native to Mexico, corn is a celebrated staple of Mexican cooking. Still the main starch in the country, despite the popularity of imported flour and rice, Mexico's indigenous people were the first to grow corn in around 1200 BC. Through a process called nixtamalization, fresh corn is made into corn flour, also known as masa–a ubiquitous part of the Mexican diet in many forms, from corn tortillas to tamales. Tortillas accompany most meals the way that bread or rice does in Europe or Asia. For an easy taste of Mexico, search out some soft corn tortillas for these Tinga de Pollo Tacos. Also native in Central and South America, cacao was brought over to Europe by the Spanish, making the chocolate we know and love merely a copy of the original. Mexican chocolate is made from roasted cacao nibs and cinnamon, making the texture more granular and the flavor more distinct than what we might be used to. Sometimes flavored with a variety of spices and chilis, depending on the region and the producer, Mexican chocolate is a unique ingredient. Traditionally used for both sweet treats like hot chocolate and savory dishes like Mexican Mole Chicken, you'll want to add a teaspoon of cinnamon alongside regular bittersweet chocolate if you're substituting European chocolate for Mexican. Try it in this Spiced Hot Chocolate Mix and add some chili peppers or cayenne for a subtle kick. Why Are So Many Professional Kitchens Run By Men?